Rapidly mobilize the enterprise for decisive action during a security event. 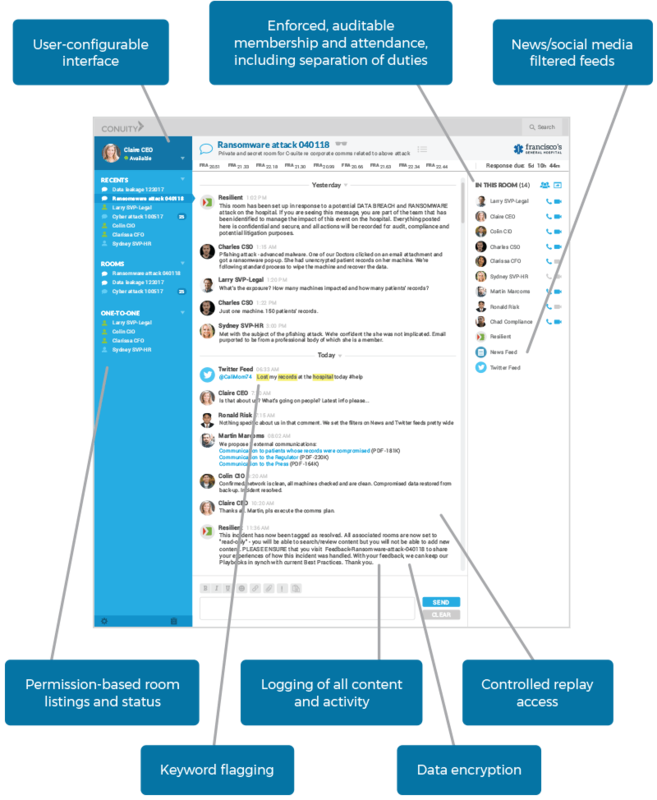 Your Leadership Team controls who sees what, when, and why in secure virtual rooms that keep all authorized participants 100% informed during an event or business workflow. Decision-making is faster, smarter, auditable, and compliant. The brand is protected. Prevents leakage of information to unintended parties via general communication channels. Maintains permanent archive of messages, participants, and other activity for compliance with legal and regulatory requirements. Utilizes history of past incidents to refine future response processes. A secure Conuity “virtual collaboration room” is instantly spun up – this internal virtual room is based on pre-configured workflows triggered by industry-leading SOAR solutions. Information about the attack is escalated and shared across all authorized participants in real-time – the virtual room brings together relevant executives and experts from IT, Legal, Human Resources, Data Privacy, Risk Management, and other departments to assess the incident, make decisions based on known information, and act quickly to address risks to customers, staff, and operations. Remediation and response are swift and effective – all necessary actions are taken, including responding to and notifying impacted customers, investors, employees, partners, and other stakeholders. The potential risk to the enterprise, its stakeholders, and its brand is minimized. The room is spun down (closed) when the incident is resolved or workflow is complete. The peace-of-mind you and your teams deserve. Ensures single-screen situational awareness via internal/external information feeds and sources. Provides comprehensive audit trails and other tools help ensure compliance with regulatory and other mandates. Manages actions of participants and enforces separation of duties through policy-based access controls. Helps control what information should be shared externally, through Conuity’s flexible policy framework. Ensures all information shared is archived and preserved as evidence.